At The Riverside Nursery, Forest School sessions take place regularly over a period of weeks with the same group of children. Sessions are aimed at our older children, aged three and over, or at least during the year before children start school, ensuring as many children as possible can take part. We don’t make any additional charges for Forest School making it inclusive for all. Forest School supports learning across the Early Years Foundation Stage curriculum including the development of listening skills, learning from practical activities, co-operation and team work. Where did Forest Schools originate? Forest Schools originated in Sweden in the 1950s and were adopted by the Danish and soon became an integral part of the Early Years programme of education. Earlier in the 20th century, using the outdoors as a space for children’s education was recognised by Margaret McMillan, a pioneer of nursery schools in the UK. She advocated the use of outdoors where children could experience fresh air, plants, trees, and opportunities to climb and play in the wilderness. Placing a high value on the education of the imagination, she identified that creativity was an important part of early development. McMillan spoke about the importance of children’s health to their overall well-being and created a nursery in Deptford where children could use a large garden to play and exercise. She also established a residential camp in Kent so that London children could experience being outside. In the UK the first Forest School was sited at Bridgewater College in Somerset and arose from a visit in 1993 by college lecturers to a school in Denmark where they saw young children using and exploring their outdoor area. These children were engaging in activities that may have been considered risky but in fact they showed competence using tools such as knives and saws, were climbing trees, and most importantly were engaged and having fun. What does Forest School look like at The Riverside Nursery? In the outdoors there is a new classroom every day where children will experience the changing seasons and different weathers; it may be hot or cold, sunny, raining or even snowing. The Forest School sessions we offer at The Riverside Nursery will give children an opportunity to enjoy being outdoors in a safe environment. They will quickly learn boundaries at Forest School that will allow them to be independent. The Nursery Manager is a trained Forest School Leader. Adult:child ratios are high, ensuring the safety of children at all times and any risks at the site, or with activities, are assessed to reduce them to a low level. Adults show children how to use equipment and tools safely, introducing new skills gradually over the weeks. 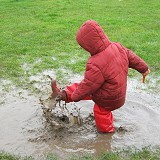 Children will learn to recognise hazards by helping to assess the areas they use and marking them out for themselves. Before children take part in activities such as lighting fires, we will first teach them about the boundaries and rules of the fire pit. Only when they are competent and understand these safety rules will we begin to teach them how to build a fire. Learning to light a fire may take several weeks, as we break the processes down into stages. Breaking activities down into small, manageable tasks that are achievable and lead to success will make children’s experience of Forest School a positive one. They will be given praise for their efforts and over the weeks children will develop their skills, becoming confident, independent and creative learners. Forest School offers a holistic approach to learning whereby they will engage in activities that use all their senses; visual, touch and taste. When children experience activities where they; see it, feel it, smell it, and importantly, do it for themselves, they will be more likely to remember what they are learning.